You won an Emmy for Season 1, but the show has faced a gamut of reactions. Do you have an idea of what the show’s legacy will be? Do you think Season 3 will change it all? I’ve always been a fan of it since Season 1 and on. I think, if anything, we as actors are comfortable in the roles now, in the characters. It takes a while. On Broadway, you do three weeks of previews before opening. It feels like with Season 3, we opened. There’s certainly a lot of comfort there now, even with Aaron [Sorkin] in the writing, too. We know more about who these people are and about what works and what doesn’t. Season 3 could be the strongest, not only from the writing but also from the performances. But we’ll see, it’s not up to us to decide. Why is it time for the show to end? It’s really difficult to do well. Aaron writes every word of every episode, and that isn’t the standard way to do it on a series, whether it’s six, 10 or certainty 22 episodes. You pass them up. You write Episode 2, someone does Episode 4, another does 5. That isn’t how Aaron works, which means every 12 days, a new episode has to land on everyone’s desks, and it has to be great. It has to live up to him, it has to live up to what the last episode was, and that’s difficult. Every two weeks he has to climb up a mountain. Then there was a lot of memorizing. My weekends, forget it! I brought in golf clubs for the first season and they never left the apartment I was renting. To go to a golf course for four or five hours would be a complete waste of time, because I needed that time to memorize and re-memorize, so that when I got there on Monday I knew it. That I won’t miss. As I told Aaron, “The memorization side of my brain thanks you immensely for bringing it to a close.” But also — and I know this is only my first television series — it’s very difficult for a series to sustain itself year-after-year and to keep the level up. At some point you’re not telling as good of a story anymore and you’re deteriorating. You have actors leaving for other projects because it’s starting to fade, and you’re the star so you’re not leaving. You’re there, but it’s not what it used to be. We don’t have to go through any of that. It’s three and out. I told Aaron to let us just look at it as a job well done. There’s been no bitching about why there’s no Season 4. It’s three and out, and that’s three more seasons I’ve had with Aaron Sorkin than before I did “The Newsroom.” So I’m grateful. The Season 2 finale almost felt like it could be a series-ending episode. Did you ever get the feeling that might be the case — that you might not be back for Season 3? Not until after Season 2 was done shooting and we weren’t picked up for Season 3 did we start to get wind that it could be a finale. Everyone sat down — HBO and Aaron — and decided one more would work. We could’ve said that was a great ending, but there was more to do, and lots of people wanted it to happen. Not just Aaron and the cast, but fans, too. So for six episodes we threw everything we could at it and now we think we have an even better ending. I’m very excited for it, and the only reason I’m asking so much about the ending is because I don’t want to see it happen. That’s a selfish reason on my end. Yeah, yeah. [Laughs.] It is what it is, man. Maybe it’s the gypsy or nomad in me that’s being so passive, because for me it’s like, “Ok, time to pack up and move on to the next project! What’s next? Where to next?” It was thrilling to do, but man, when you’re handed an 80-page script and you [only know] 60 pages of it and you shoot Monday — my head is already starting to hurt. Everybody should know by now you have “The Newsroom” coming out November 9 and “Dumb and Dumber To” out the following Friday, but you also have a CD you just released, and your website states you’re writing another play for the theater you have in Michigan. How do you balance this much of a workload? Is it just a passion that takes over you? Coincidental timing? It seems like you’re multi-tasking yourself into the grave, doesn’t it? Me and Jim [Carrey] were talking about this the other day, and he paints. It’s an outlet. A lot of times we spend waiting. Waiting for the phone to ring, waiting for that movie to get the money it needs so it can be made, and before you know it weeks and months have gone by. Certainly “Newsroom” was something where I couldn’t do anything. Certainly by Season 3, I was able to work on the guitar and write songs and get ready for this tour. I just went out with my son’s band, and so I could sort of do that during the day when I felt I had the scenes memorized. But it’s a creative outlet. We’re kind of like sharks in that we have to keep moving and we have to keep creating. That’s where someone like me feels most alive. Now, with “Newsroom” done, the demands of that show are gone, and now I have time to focus on working on the play for theater. And it won’t be done for a year probably, but at least I have the time do it. And the songs have always just been there. The guitar was a hobby, and it became a friend. It’s that wonderful place where no one tells me what to do. I can pick the set list and I can change it up. I can write the song this way or that way. There’s no committee, or studio, or director or editor standing in the way. You’re in complete control — all the pain and all the glory. I like that. I think it’s also part of the fatalist in me who moved back to Michigan in 1986 after living in New York City for 10 years, because I thought eventually my career would be over, so why not already be home? Part of this is like my backup plan. Part of it is if the career were to end — and this isn’t the week to be thinking about that for sure — but what would you do? And I look at the guitar and know instantly that I would be happy playing 200-300 seat clubs or opera houses and touring. I would be so happy during that. It’s this thing I enjoyed doing, thinking that it would one day be what I was doing. I’m going to precede this question by saying I’m glad you don’t have to make this choice. But if you had to choose one thing, and money wasn’t an option, what would you do? The guitar. The gigs. There’s such a joy and creative freedom that comes with it. I’ve been making movies and I’ve been hitting marks for 38 years. You look for new things to do and for new challenges that are still creative. Writing has always been of interest to me. It’s very difficult to do, and I like the challenge of that. I like the challenge of playing live in front of people without a band and having all the guitar players stare at your hands waiting for you to screw up and you don’t. That’s great fun. It’s always a surprise. About the plays you’re writing, do you write them with a role for yourself in mind? No, I didn’t. The plays were always intended for the company of actors that we have at the Purple Rose at any given time. That’s how [Lanford Wilson did it at Circle Rep]. He had a company of actors and he would get an idea for a script and then, much like Aaron did on “Newsroom,” he would tailor it for the people he had. It’s a wonderful luxury to know you can write for this person or that person, or when you know you have an actor who can bring a character to life. Certainly being in Michigan, it’s not like New York or LA, where there’s a limitless number of actors of all different ages and talents and types, but I like that. The actors like that. It’s like being tailored for a suit. I never write for myself, though. It’s always for them. I’ve written 15 and they were never intended for me. I’ve always had someone in mind by the time the third draft came around, so I’d write the fourth and the fifth specifically for them. It’ll be interesting to see what we do in the next 10 years. Broadway was thrilling and great, and I could go back there, and I’d love to go back there, but I can also stay in Michigan. I’ve never acted on the Purple Rose stage before, and I’ve been kicking around ideas on how to get there, for no other reason than it’s a 10-minute drive from my house. Have you noticed your writing style changing at all after working with Aaron Sorkin? He writes so similar to theater, the sheer verbosity of his work. Yeah, subconsciously. 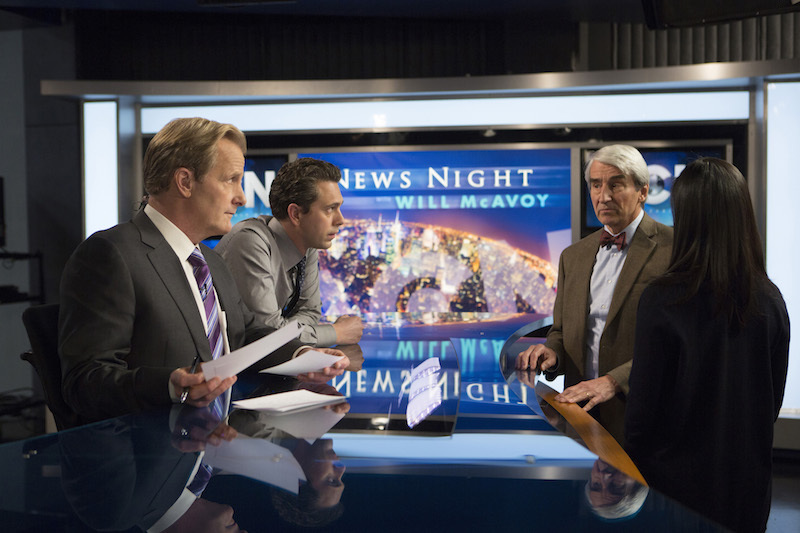 On “Newsroom” — and I’m sure Aaron struggled with this — you needed to get them talking. Whether it’s listening or waiting, or whether you’re spurring them like a horse, you got to get the characters talking. Once they start talking towards the outline of your ideas, now you’re off and running. I think he was able to do that, and I think he waited for that. I remember him coming in at times and after I asked how an episode was going, he would say, “I’m on page four.” They weren’t talking to him yet. It’s a strange, kind of magical mystery. It’s only later than you come in and start corralling them and steering them. I wouldn’t say that suddenly the next play is going to be Sorkin-esque. But it was more the similarities. I’ve always been fascinated with writing. Certainly watching Aaron work. I never changed a word. I never went up to him wanting to rewrite a speech or change a single thing. It never happened. He handed me the script and he might tell me the intention or remind me if something is supposed to be a joke, but basically he wrote it and I acted it. I have such respect for the written word and for Aaron, so that’s what I wanted to do. It’s more the similarities of the approach, and that kind of torture of waiting for the characters to take over, the endless waiting period. Writer-to-writer, you telling Sorkin you won’t change anything, that respect has to be a big deal for him. That’s a big compliment. Not only that, but also Hollywood is full of actors who think they can write. And to be fair to them, sometimes you get on a bigger movie and you realize that it’s been written to adhere to the notes of a Junior Executive who has only read “How To Write a Screenplay.” You just can’t act it, so you ad-lib around it and you make it fall out of your head to make it seem more natural. I’ve done that, but you don’t do that with Aaron Sorkin. And you certainly don’t do that on Broadway. Aaron worked very hard to hand you this script, so you don’t throw his words back at him with what you think they should be and what you think it is he intended. It helps that Aaron is just such a great writer. It’s very clear what Will is doing, thinking and saying, so all I had to do was execute it. As a friend told me before Season 1, “Wait until you see what you get to say.” And that’s unique to Sorkin, it really is. Character after character, they get this great dialogue and these great lines and speeches. My god, the Northwestern speech! Actors wait decades for a speech like that, but suddenly there it is. You said in another interview that last season, in the “Red Team III” episode, the Jane Fonda scene was the “Jane Fonda scene to beat all other Jane Fonda scenes.” Is there anything like that coming up for fans in Season 3? 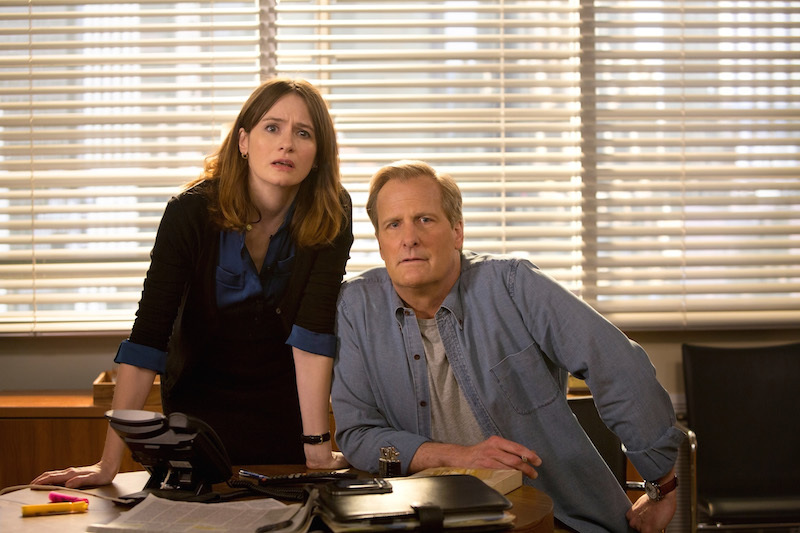 Is there a Jeff Daniels scene that tops all Jeff Daniels scenes? Or an Emily Mortimer scene? I’ve seen three of the six episodes, and I think so, yeah. Specifically to the Northwestern speech, I think that speech, years form now, will still be watched on YouTube or whatever YouTube is. I think that will outlive me. I think there are scenes in “Dumb and Dumber” that will outlive me. They’re iconic. They become iconic. Maybe there is some of that in Episode 3, it’s hard to remember. I know HBO is very, very happy with Season 3 and that all the performances are great. Whether it’s a big speech or huge scene or a series of scenes for me in Episode 5, there’s a bunch there [that’s] pretty great. It certainly doesn’t dip, I know that.